Continental Tire the Americas LLC has released its ContiPressureCheck commercial truck TPMS technology in North America. The ContiPressureCheck is designed to monitor, display, and alert the driver of any sudden changes in tire inflation and temperature. Such technology should be an essential part of fleets across the continent. Overall driving costs can be greatly reduced in commercial trucks equipped with the ContiPressureCheck system. TPMSDirect is your #1 source for the latest in original equipment TPMS technology, industry news, and technical know-how. In 2011, the Tire Industry Association and the National Highway Traffic Safety Administration got together to address scenarios that tire dealers and service bays commonly face when performing service on vehicles with dead or defective TPMS sensors. One of the major scenarios that service bays across the nation encounter is a matter of cost and the customers willingness to replace one or more defective TPMS sensors. Without the proper training and education, technicians and staff may have a difficult time explaining the importance of TPMS and why replacing defective sensors is beneficial to the customer. Due to the lack of TPMS training, some service bays simply remove the sensors and deactivate the system all together. A decision like this puts both the customer and service bay at risk. If the customer gets into an automotive accident that can be attributed to under or overinflated tires, the service bay can be held responsible for neglecting to properly service the vehicle’s standard safety equipment. It is in fact, illegal to disable a TPMS system, regardless of whether replacements are cost-prohibitive for the customer. Title 49, U.S. Code 31022(b) of the Motor Vehicle Safety Act (MVSA): Prohibits a manufacturer, distributor, dealer, or motor vehicle repair business from knowingly making inoperative any part of a device or element of design installed on or in a motor vehicle in compliance with an applicable motor vehicle safety standard. TPMSDirect is your #1 source for the latest in OEM TPMS technology, industry news, and technical know-how. If your service bay is interested in incorporating TPMS service into its standard procedures, please email us at Customer.Service@TPMSDirect.com for more information. 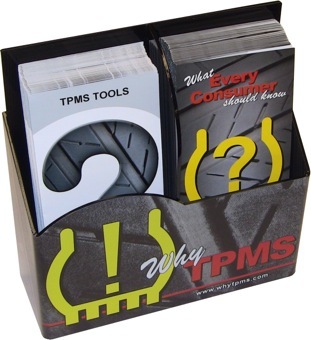 Myers Tire Supply Distribution Inc. has introduced its Interactive TPMS Education Point of Purchase Kit. This comprehensive package is designed to assist salespeople, service bays, and tire shops in educating the consumer about the various benefits of TPMS and why the TPMS service kit should be replaced anytime the sensor is removed from the wheel. 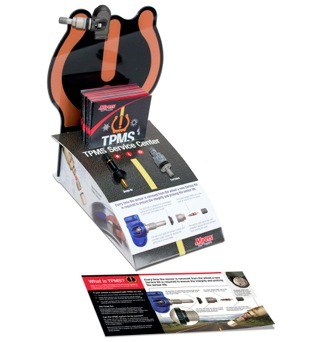 The TPMS Education Kit includes a counter top display, 100 consumer brochures, and an informative wall poster. TPMSDirect is your #1 source for the latest in OEM TPMS technology, industry news, and technical know-how. The Ken-Tool reCore extends the life of broken tire pressure monitoring sensors (TPMS) when galvanic corrosion has damaged the valve stem and core. TPMS sensors can be repaired on the vehicle without having to dismount the wheel and tire. A time and money saver for both the shop and customer! Essential for any repair bay that services TPMS! Schrader has invested $10 million into its Spring, Tennessee TPMS production plant. An increase in demand in the TPMS service, repair, and aftermarket has prompted Schrader to engage in the investment. The new production line has boosted manufacturing capabilities by 8 million sensors and has created 76 new jobs within the facility. Schrader intends to add another production line by 2014. TPMSDirect is your #1 source for the latest in tire pressure monitoring system technology, TPMS industry news, and technical know-how. Do the factory installed TPMS sensors on your BMW need to be replaced? Are you looking to install TPMS sensors in your spare wheel set? 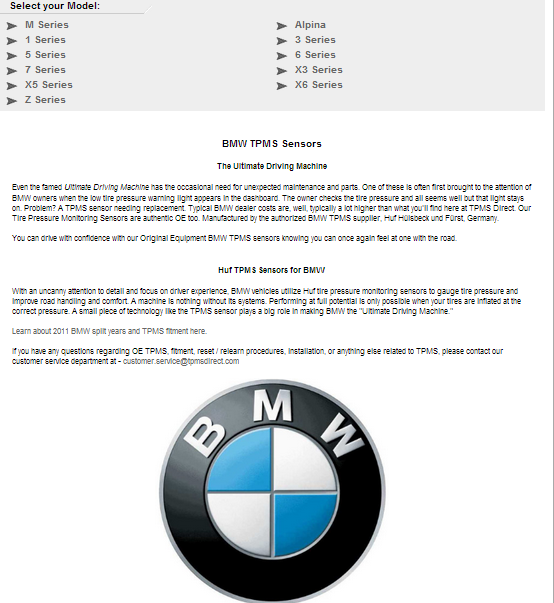 TPMSDirect is your #1 source for the latest in BMW TPMS Sensor technology. BMW utilizes a Direct tire pressure monitoring system in all of its vehicles. A Direct TPM syste uses tire pressure monitoring sensors installed in each wheel to measure pressure in each of the four tires. Pressure data is then transmitted wirelessly to a central receiver unit. The unit interprets the data and relays the information over to the driver. Modern technology allows TPMS data to be displayed on the vehicle’s on-board computer, with individual pressure readings in each tire. A traditional, more widely used system, simply displays a TPMS warning light (_!_) when the pressure in one or more tires is 25% or more below factory specifications. We carry original equipment TPMS sensors produced by leading European TPMS manufacturer Huf / Beru. The following BMW vehicles come factory equipped with Huf / Beru TPMS: 1 series, 3 series, 5 series, 6 series, 7 series, X1, X3, X5, X6, Z Series, Alpina, and all BMW M models. Visit TPMSDirect to find the latest in original equipment tire pressure monitoring sensor technology for BMW and get your vehicle back to being the Ultimate Driving Machine. Bartec USA, a major player in the tire pressure monitoring system industry, has released a new Consumer TPMS Education Package. This package is designed to help tire dealers and service bays better explain the need for TPMS and the importance of proper TPMS maintenance. Has your shop incorporated TPMS service into its standard procedures? Are you ready to take your level of understanding to the next level? TPMSDirect has what you need to get started. Contact us at sales@tpmsdirect.com for more information.